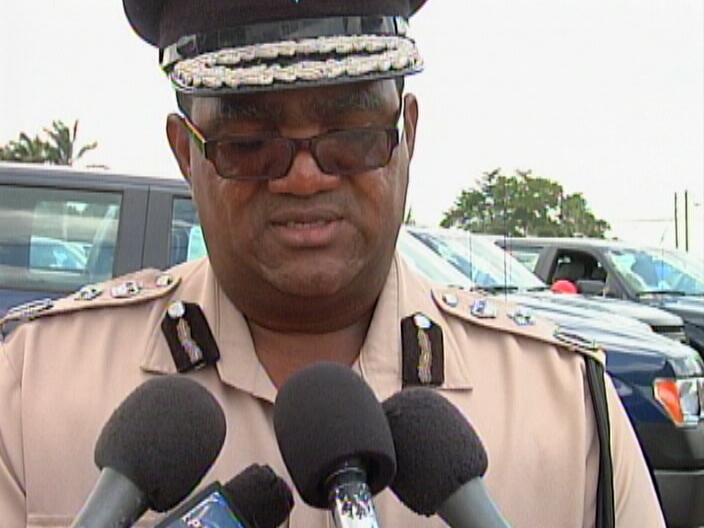 The police department today received a hefty donation courtesy of the United States Embassy. It involves a brand new fleet of vehicles valued at more than two million dollars. 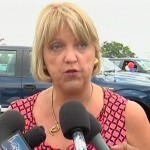 The US Charge d’ Affaires, Margaret Hawthorne, says that the heavy duty trucks will be used to improve citizen security. News Five’s Isani Cayetano was on hand for the ceremonies. 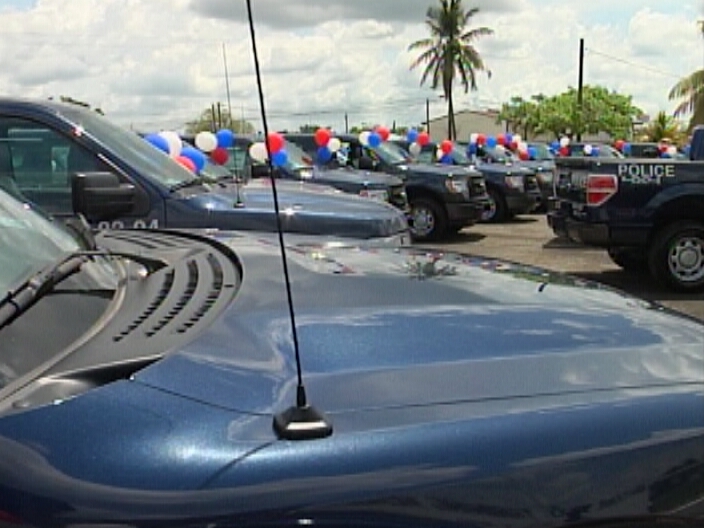 A fleet of thirty-eight vehicles, mostly Ford F150 heavy duty trucks, was today handed over to the Belize Police Department by the United States Embassy. The donation, valued at approximately two and a half million dollars, is part of the Central American Regional Security Initiative (CARSI). The vehicles, which have been deployed to various parts of the country within the department, will see an increase in mobility, visibility and quick response. The reality is that after a few months a great deal of those vehicles will have already been experiencing the effects of wear and tear. Their deployment across the country will see them complimenting an existing nationwide fleet. Thus far, previous vehicles donated through CARSI have assisted tremendously in facilitating mobile patrols in Belize City, resulting in a significant decrease in crime. That particular example has led to an expansion of the initiative. Since 2009, the United States Embassy has implemented over fifteen million dollars in CARSI-related initiatives in Belize. Reporting for News Five, I am Isani Cayetano. 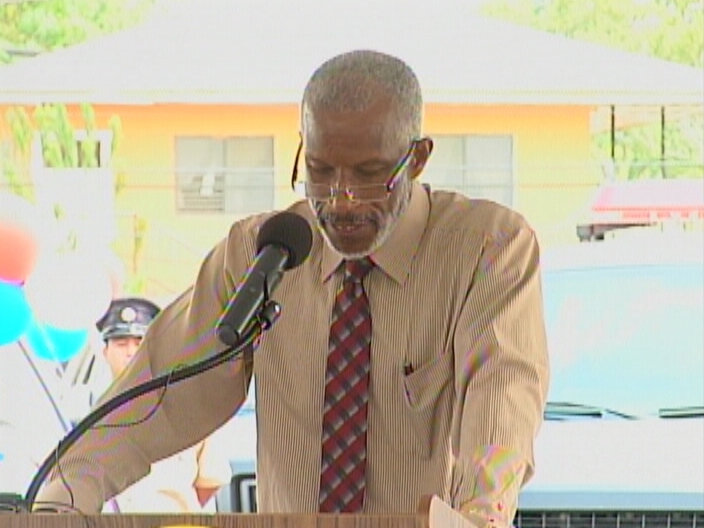 "This contribution today will significantly improve the resources of each and every police formation." The 38 vehicles cost 2.3 million dollars and will be deployed to formations and units across the country with emphasis on crime investigation, community policing, quick response, and the K9 Units." "By working together, we can push back against criminal elements, build stronger communities, help serve and protect the Belizean people and promote economic growth in a secure environment." This donation surpasses the last one from June 2012, when the US donated 17 Rangers. That donation is viewed as a success because major crime went down in 2013. "It's been a tremendous decrease in crime last year, and we're hoping that this will continue, and we hope that these vehicles will assist that effort." And now these heavier, mostly Ford F-150 pickups, are extension of the partnership on security between the US and Belize. "These vehicles that we are receiving here today, that is estimated to value 2.5 million dollars will allow more efficient execution of our security forces functions for a long time to come." 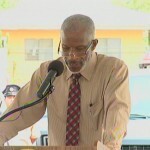 And to keep the US engaged, Belizean authorities are stressing on care, maintainance and proper use." 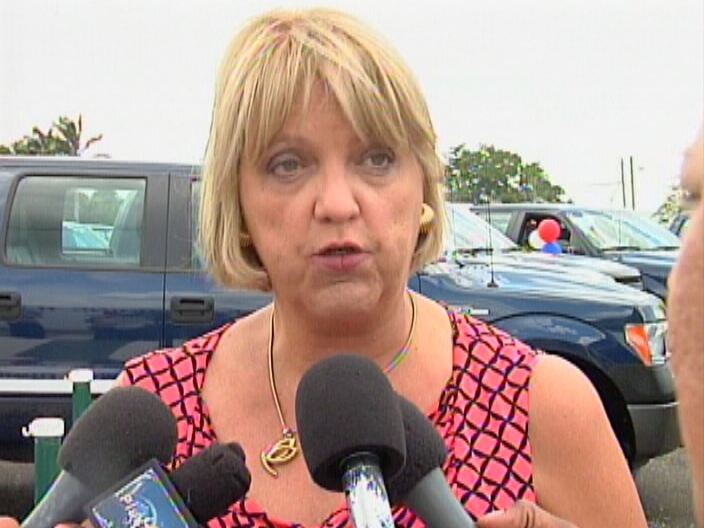 "I'm very serious; we have been clamouring quite some time for vehicles. We've been asking for the handing over of those vehicles. It is here today, and you, regional commanders, formation commanders, precinct commanders, are responsible to ensure that they are properly utilized. "It is important that we continue to demonstrate that we are committed to do our part to ensure effective use of the aid to meet our objectives. For that we must take the necessary steps to ensure good husbandry of these gifted vehicles and have them serve us for a long time. "Commander Administration has been charged by me that where there are abuse and damages, somebody will pay." But Government will also have to pay, a heavy gas bill for these larger pickups. "I know that we have 38 new vehicles that have been assigned to us, but I as the accounting officer must be real when it comes to the logistics to ensure the effective use of these vehicles. I do not have - and neither does the Government of Belize Ministry of Finance - a bottomless pit from which we pull our financial resources. And so, I want to caution that we bear this in mind." "We know that you all are used to 4 cyclinder diesel engines in the Mahindras, Hiluxs, and the Dmaxs, but a lot of these are 6 and 8 cylinders." "But, we believe that despite the fact that they are 6 and 8 cylinders, they are new vehicles, so they should be highly efficient in terms of fuel. 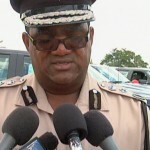 As I said, the commanders will have to ensure that they are properly utilized." "We have to provide 24 hours' service, and we cannot tell the people that we do not have vehicles." Whylie could not tell us what percentage of the last set of 17 Ranger pickups are still road worthy.